The Barcelona Opera House Chamber Orchestra that performed a seemingly never-ending opener made the Samsung MWC 2014 press conference's 50 minutes feel short and subdued. However, the South Korean electronics giant still hit a lot more right notes Monday than it did last year at its widely panned Broadway-inspired product unveiling. There was no song-and-dance routine to distract from the Samsung Galaxy S5 and the company's new wearables. Reflecting its stripped-down and refocused talking points, Samsung insisted that it had gauged customer feedback worldwide and opted against delivering an all-encompassing device. Instead of eye-popping technology with bloated software, it has chosen more practical hardware upgrades in its phone and wearables. Samsung already unveiled its follow-up to the Android-based Galaxy Gear smartwatch prior to MWC. Little did we know it was teasin' more than just a Tizen operating system for the minimally changed Gear 2 and Gear 2 Neo. The Gear Fit turns wearables on their head by turning the display 90 degrees and stretching out the high-resolution display. In this way, it checks off another "world's first" for Samsung thanks to its incredibly rich curved Super AMOLED display. Consumers, still perplexed by Samsung's flexible TVs and curved smartphones, can make sense of this new technology within wrist-mounted wearables. The Gear Fit is part-smartwatch, part-fitness tracker and fully fashionable. It can receive instant notifications, reject calls, control alarms and keep track of your wellness through S-Health 3.0. Its functions completely eliminate the need to dig your phone out of your pocket in a number of cases. It also does away with the drudgery of foolishly running to your phone that's charging in another room, only to realize it's just a menial text reply of someone saying, "K."
Always on-wrist, this accessory, at just 27 grams, solves these first-world problems. And unlike the Fitbit Force, Nike FuelBand SE and Jawbone Up, it includes a heart-rate monitor, a sought-after feature among quantified self-fitness enthusiasts. Gear Fit is being supported by an impressive 20 Galaxy devices. Contrast that to the Galaxy Gear, which initially worked with just one phone, the launching-in-tandem Galaxy Note 3. No one owned this phablet prior to their simultaneous day-one launch. You had to shell out cash for both if you wanted the first Gear. On top of that, Samsung announced that it has sold more than 200 million Galaxy S phones worldwide. That translates into a lot of Galaxy Fit-compatible devices. However, Samsung has failed to learn the art of the lure. It finally has an impressive new device that is expected to be cheaper than a smartphone and without a contract. That's why the Samsung Gear Fit should work with iOS and all Android devices. Without such interoperability, iPhone 5S owners, for example, won't be tempted to own a Samsung phone. Apple pulled this off when introducing its iPod and later the iPhone, turning millions of PC consumers into Apple-loving Mac users. 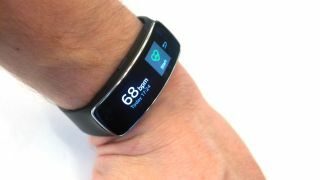 At the right price, The Galaxy Fit can act as that same "gateway drug" device that gets people to really appreciate and rely on the Samsung brand. It hasn't learned that tact just yet.